This is the first Robert Still recording on compact disc. That it is here at all is down to the industry, skill and dedication of J Martin Stafford whose Ismeron label has already made its distinctive mark. 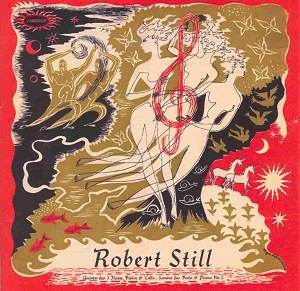 You can read a lot more about Robert Still at a webpage devoted to his life and works. In summary, Still was a British composer of the Cheltenham generation. He suffered neglect as did so many during the period 1945 to his death in 1971. His works include concertos and four symphonies two of which were issued by Lyrita. The record industry did some work for Still but just as with Frankel, Stevens, Wordsworth and Searle there was vanishingly little. In the early 1960s Saga recorded the Third Symphony with the ailing Eugene Goossens. That recording resurfaced on a Lyrita LP in the early 1970s coupled with Fredman�s version of the Still Fourth Symphony. Years before that the recordings on this disc were issued on LP in small circulation runs on Argo - would that some company would rescue the impossibly rare LP of Balfour Gardiner choral-orchestral music! - and the Record Society. The latter also included songs by Goossens and Finzi. Still commissioned and paid for all these recordings. The four movement Quintet is for three flutes, violin and cello. This makes for a very full-lipped and warmly pressurised sound. Accentuated by the enclosed recorded ambience it almost inevitably sounds steamily Gallic even when the music is in repose. The final movement is cooler, emotionally speaking, but playful. With Gilbert, Pougnet and Gabarro in the quintet Still was clearly well respected by the best musicians of his day. For that reason it is no surprise to find Frederick Riddle as violist in the Viola Sonata No. 2 - one of three such sonatas for the instrument. This is a likeable, fairly sombre and subdued work. It is dignified rather than exuberant. There is however an outgoing finale Ghiribizzoso (whimsically) which is something of a tour de force for both players. It ends, I think, in a rather perfunctory way. Still�s songs make up the other half of the disc; seven each for soprano and baritone. The soprano for all but one is the young Heather Harper recorded in 1958 or 1959 when she was 28 or 29. Her voice is rather more blustery and undifferentiated in dynamics than we are accustomed to from the mature and glorious voice that emerged in the late 1960s and throughout the 1970s. The songs are variously dramatic, touching and playful. They will appeal to anyone who enjoys British song writing in the classic Finzi and Warlock styles. It is not a facsimile of either composer but is certainly in their vicinity. There is nothing of dissonance and much of warm lyricism in this writing. If Harper sounds a mite tremulous then John Carol Case is admirably in character. He is so much more stable in his hold on the notes than when he was caught in the 1970s Lyrita sessions for the Finzi Shakespeare Songs. His voice marks out the words with pleasing definition and a real sense of handsome engagement with the meaning of what he sings. His tone is that of a stentor without the shouting. Awaiting Execution and Sunset on the Morea brings Still very close to the gloomier Warlock songs. The latter has a warm and valedictory Delian quality. There are two more songs recorded at a Wigmore Hall concert in 1959. First Jessica Cash sings The Sea Hath Many Thousand Sands - another subdued song. Gordon Clinton regales us with Shall I, wasting in Despair - a ringing and skipping Stanfordian ballad. After this splendid revival I do hope that someone will throw a lifebelt to Decca SXL6281 which was issued in the early 1960s. It included works by Still and Rubbra. The conductor, Myer Fredman, a friend of the composer conducted a performance of Still�s Concerto for Strings in Wigmore Hall on 19 February 1965 and recorded it at the Kingsway Hall in November 1966. The orchestra, on both occasions, was The Jacques Orchestra. The Still coupling was his Elegie where Fredman and the orchestra are joined by John Carol Case and the Ambrosian Singers. These artists also perform Rubbra�s Inscape on the reverse side of the LP. Once again the recording sessions were financed by Still. There you have it: a generously loaded disc representing the chamber music and songs of Robert Still. This is pleasing music-making and the very unusual quintet is more than that. Lovers of British music will need this: Still�s only representation on compact disc.